I don't remember exactly which convention it was where I heard the news, but I remember exactly what I thought when Kromm and Pulver took me aside and told me that GURPS was going to get a new, unified, streamlined edition. I thought, "Glad I don't have to do that." Well, the joke was on me in part, because I got hired on as Staff Writer for Steve Jackson Games and produced a lot of suggestions that weren't used and a few that were, most noticeably the "iconic characters" for GURPS Fourth Edition. Some of their backstories confused Steve, but he gave me GURPS' backstory to rewrite anyway: I got to add random worldline creation and the SS Raven Division and about 120 pages to the "Infinite Worlds" setting in GURPS Infinite Worlds. Then I, and about 40 pages, were cut. 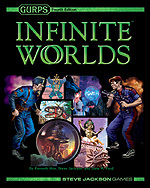 I bounced back, as did 30 of those pages, in GURPS Infinite Worlds: Collegio Januari (where we got a fantasy Infinity War, between Templars and magi) and GURPS Infinite Worlds: Lost Worlds (where a couple of those backstories made a comeback). This seemed like such a great model for GURPS supplements that I eventually scared up six more timelines for GURPS Infinite Worlds: Worlds of Horror, from Etruscan vampires to German killbots to everybody's zombies. 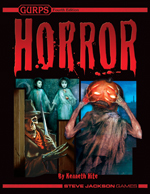 This of course was a cunning scheme to support the (somewhat) new and (very) horrifying GURPS Horror, which I updated profusely with splatter and crunch and 50 more all-new pages (details in the designer's notes). Those pages didn't include my horrifying "Madness Dossier" campaign frame from Third Edition, so I leapt-ish into action and eventually emerged with 64 pages of linguistic mind control, scorpion-men from other histories, and William S. Burroughs references. Ten years later, I'm glad I got to do all that.